Chuey Quintanar tattooing a portrait of his client's first born daughter. Freddy Negrete (left) at the Shamrock Social Club where he tattoos alongside his son, Isaiah. Freddy Negrete, 61, works on a tattoo on a customer's shoulder. Negrete's son Isaiah, showing off one of the many tattoos his dad inked. 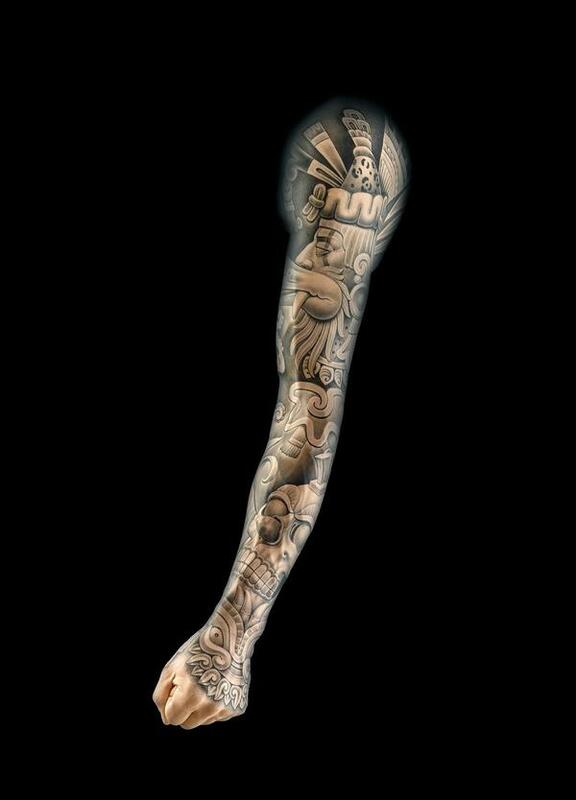 Chuey Quintanar's tattooed silicone arm. Tattoo artist Kari Barba in the studio she owns in Long Beach, Calif., called Outer Limits Tattoo. Tattoos are no longer taboo. According to a Harris poll, about half of American Millennials say they have at least one, and so do a third of Gen Xers. Once you have one, data show, you'll get more. Today, an increasingly popular style of tattoo art is called black and gray. Black and gray used to be referred to as joint-style or prison-style, because of its roots in penal institutions, where inmates made homemade machines from ballpoint pens, guitar strings, needles, and parts from old boom boxes. The machines had one needle. No color ink was available in lock up, so the ink was black. But if you watered it down, it turned gray. Rather than the thick black outlines and bright colors of traditional-style tattoos, black and gray tattoos have finer lines and subtle shading. These days, they're so detailed, they look like hi-def black and white photos. One of the people credited for mainstreaming black and gray style, is 61-year-old Freddy Negrete. He says it wouldn't exist without "prison ingenuity." And, he would know. Negrete's been in and out of lock up since he was a teenager. 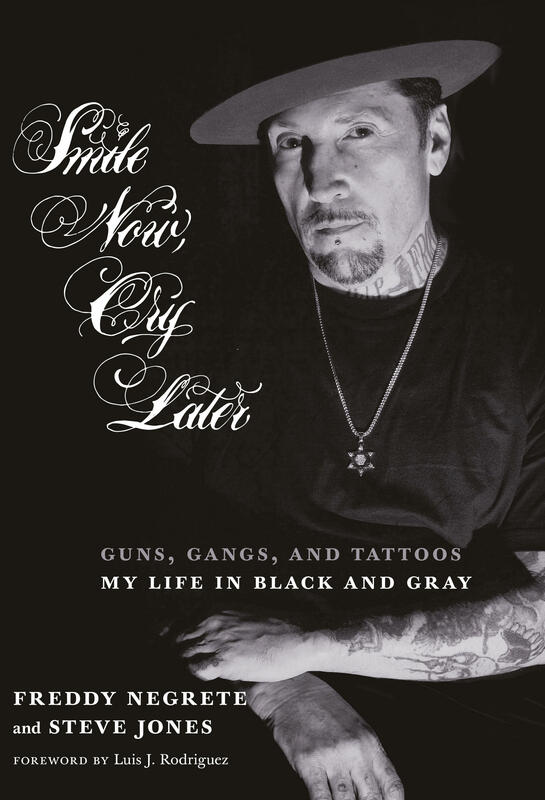 In his memoir, Smile Now, Cry Later: Guns, Gangs, And Tattoos, My Life In Black And Gray, Negrete writes about his parents incarceration, his years in an abusive foster home, and his search for belonging and acceptance in one of Los Angeles County's most notorious Chicano gangs. He writes that gang culture in Los Angeles had its own language and style. And, tattoos were a major part of that style. "I displayed my ink with pride - a mix of Aztec, Mexican revolutionary, and cholo imagery. These were our campfire stories, our myths, the marks of our culture. And once marked, you were marked for life." Tattooing became Negrete's life work. His super power in the penitentiary was his ability to draw. It was his currency, he says. He made stationary with Chicano imagery for the other inmates to write letters on. Paper decorated with roses, Catholic and Aztec symbols, portraits of girls dressed like Mexican revolutionaries with gun-belts and sombreros. One of his most famous drawings from back when he was a young man came from his time in the California Youth Authority, (now called California Division of Juvenile Justice.) 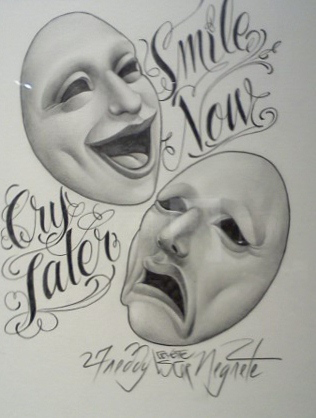 It was of the iconic comedy tragedy masks with ornate lettering that read, "smile now, cry later." If you go into most tattoo shops and request a "smile now, cry later," Negrete says, the artist will know exactly what you're after. So, how did black and gray style break out and go legit? It started when a tattoo parlor opened up in East Los Angeles in the mid-1970s called Good Time Charlie's Tattooland. Their primarily Mexican-American clientele, male and female, wanted tattoos that were done in "la pinta" (prison) with fine lines and black and gray shading. 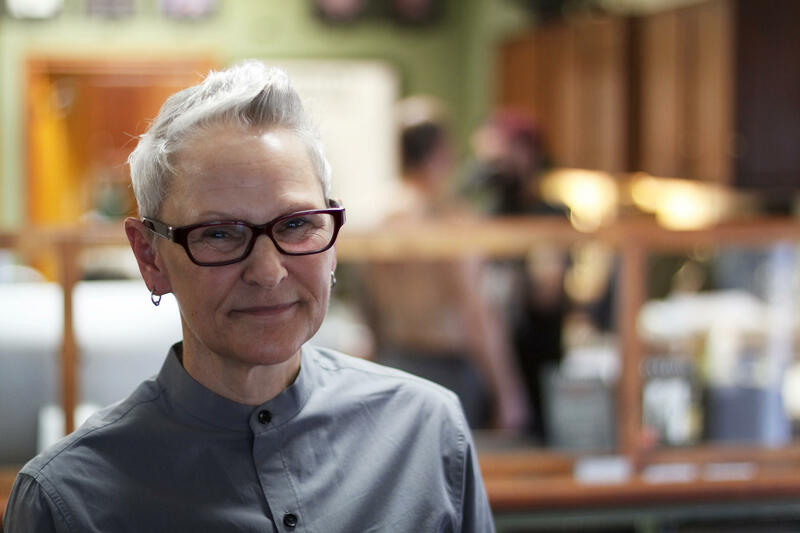 The shop's proprietors changed their professional tattoo machines to have a single needle. Freddy knew this and when he got out of lock up would send people he inked over to the shop to show off his work. He eventually landed a job at Good Time Charlie's in 1977. "I was like the first Chicano who ever even got a job as a professional tattoo artist," Negrete says. The cruising scene in East Los Angeles was great early advertising. In a couple of years Negrete was getting shine at tattoo conventions and in tattoo magazines. In the 1990s he consulted on Hollywood films that needed tattoo art. Everything from the 1993 Chicano cult-classic Blood In, Blood Out, about three relatives caught up in East LA's gang life, to 1997's Austin Powers: International Man of Mystery, a comedy starring Mike Meyers. There was a lot of drama between those career highs, though. Negrete was on and off hard drugs, was in and out of jail, and his teenage son was shot and killed by a rival gang member. In his memoir, Negrete writes that after his son's death, in 2004, he lost the will to live. He started using again and ended up in Folsom State Prison. Negrete was just a couple of years shy of his 50th birthday. 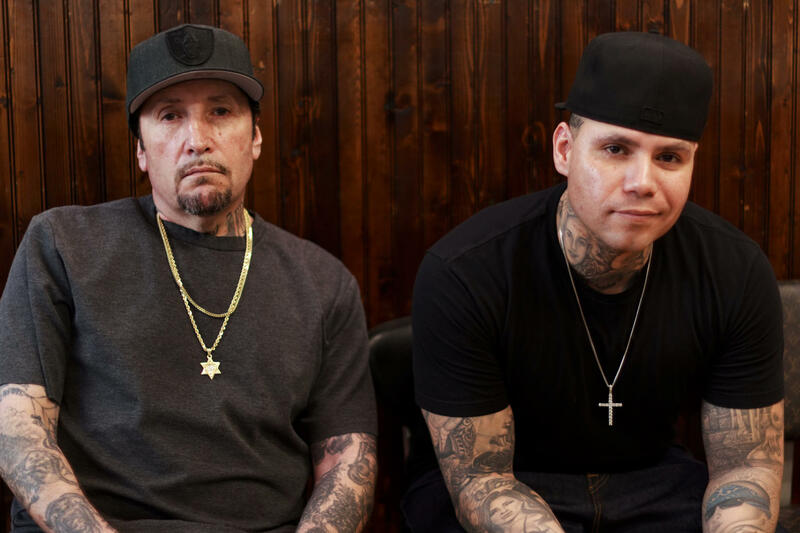 Today, Negrete's in recovery, tattooing with his oldest son, Isaiah, at the Shamrock Social Club on Sunset Boulevard in Los Angeles. He's been clean for more than a decade. And, this year, his work was featured in an exhibition at the Natural History Museum of Los Angeles called Tattoo. It takes you through the origins and evolution of the artform and Chicano style black and gray is a significant part of the show. In the first room of the exhibition, there's a life-size silicone arm with a full sleeve tattoo of Meso-American imagery in black and gray. It was created by Chuey Quintanar. He was born two years after Freddy Negrete got his first professional tattoo job at Good Time Charlie's. Quintanar didn't learn how to tattoo in "la pinta" but he did learn on a single needle machine in his garage in Long Beach, California at 14 years old. "One of my friends made me a homemade machine," Quintanar says. "He said, 'you're a good artist, you should start tattooing.' This is the way we started back in the day, there was no apprenticeship for Chicanos." Quintanar was born in Mexico City and came to Southern California as a child. The last thing his immigrant parents wanted was a "cholo" son, and back in the '90s, in Southern California, tattoos and gang banging were synonymous. But, Quintanar kept at it, and took black and gray to a whole new level. 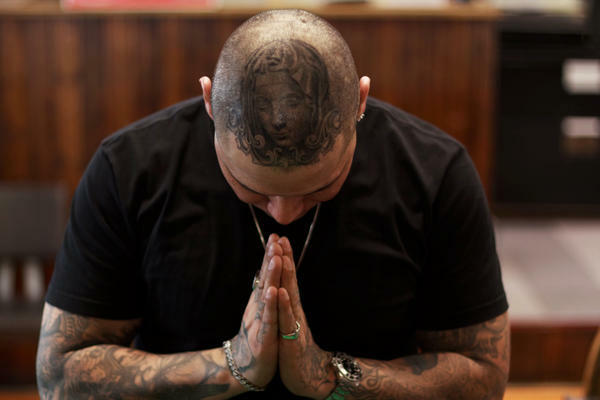 Negrete says he was blown away by Quintanar's tattoo of Michelangelo's famous Pieta statue, the one where Mary is holding a lifeless Jesus, draped over her lap. "That was the most fantastic tattoo that I ever saw," Negrete says. Quintanar got the folds of her dress, the detail of Jesus's naked torso, the way the light hit the statue - everything, just right. Quintanar's parents came to the opening night reception at the Tattoo exhibition and he says they were very impressed. His mom is totally on board with his profession, now. Quintanar co-owns a successful tattoo shop called Deer's Eye Studio and more importantly, he tattoo'd one of her favorite Mexican singers, Alejandro Fernandez. "She's always showing me off to her friends, always," Quintanar says. "She's always on my Instagram too, commenting, 'oh my son, I'm so proud of you,' and I'm like, 'mom! It's public!!!" Kari Barba's another artist who tattooed a silicone arm in black and gray for the exhibition. Barba says she was an innocent girl from Minnesota who grew up in the suburbs before she came out to Southern California in 1980 to start her life in the tattoo business. She remembers walking into Good Time Charlie's in East LA, seeing the flash work up on the walls and thinking, "Wow, that's how I like to draw, not the imagery, but the style." Barba says single needle black and gray was as close as you could get to drawing with a pen or pencil. It just felt right. But, she admits she had been tattooing in the style for 30 years before she learned the extent of its Chicano roots from the 2013 documentary Tattoo Nation. "When you start to look at where things come from, you respect them more," Barba says. "You look at me coming from Minnesota and you look at where Freddy comes from, who would think that we would be able to hug each other and say, 'you are my friend' but I really respect that guy and I feel like he respects me," Barba says. Negrete says he's honored to be in a museum with tattoo greats from the old school like Kari Barba and the new school like Chuey Quintanar. But, Negrete credits the new generation of Chicano tattoo artists doing black and gray for helping him up his game. He says he doesn't want people coming to him hoping for a "vintage" tattoo because he's a part of the style's history. He wants his work to stay contemporary. And, it has. The Tattoo exhibition at the Natural History Museum of Los Angeles ends Sunday, April 15 but Negrete will be creating one of a kind art pieces on human canvasses for as long as his mind and body will allow.